Highly recommended by 酒井法子 Japanese Ambassador Noriko Sakai. Japan's top patent product! 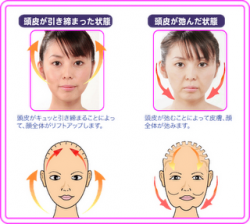 Cosmetic face-lift is that simple, it's a special 3D design & even suitable to wear it to sleep. Every morning you will be amazed of the remarkable changes. 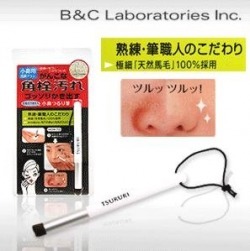 Helps to clean the pore and remove dirt around the nose area with this tiny brush. 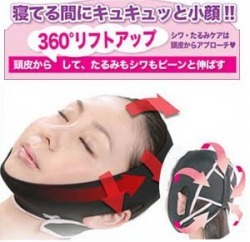 Massage your head at your own convenience. Massage at various acupuncture points to get better health! Creates foam easily, just put some warm water and use it to massage the whole face. Wash and hang dry after use. -Stainless steel precision blades safely trim nose and ear hair. -Waterproof unit with suckable cutting head makes wholly hygience cleaning. -It is safe, reliable and easy to use. It removes dirt, oil and dust from your pores, is painless and easy to scrub. Directions : Just need to moist face with water and use facial cleanser to wash, after that put on the fingers and scrub gently on nose area and wash off. 1. Able to remove black heads. 2. Able to pluck out eyebrow. 3. Convenient 2 in 1 structure. 1. Use either small or large depending on your preference. 2. Put inside your ears and turn to remove ear wax. 1. Do not put in places where is too hot or cold. 2. Do not expose to sun. 3. After using, clean with tissue will do. 2. Gently removes dirt and dust from your pores. 3. Refine enlarged pores and blackheads. 4. Simple and convenient process. 5. Manufactured using the newest anti-bacterial material. 1. Use water to moisten skin. 2. Apply normal facial cleanser to your whole face. 3. After that, use the brush to gently scrub the nose area. 4. Then cleanse with water. 1. Highly recommended by Taiwan Show, host by Lan Xin Mei and many stars. 2. From Japan & has been 1 of the top 10 sellers in Japan. 3. Removes facial hair from root. 4. Skin become smoother & become cleaner & less clogged up. 1. Bend stick into half. 2. Turns handle outwards while sliding along face. 3. Use product on face only. 4. Stop usage if you feel unwell or have wounds. 1. 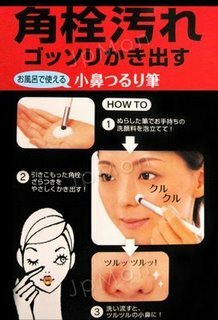 Assists you to draw your cheek blusher. 2. 3 types of cheek guide available; cute (Pink), professional (Blue) and natural (Green). 3. Cute is suitable for clubbing & casual going out. 4. Professional is for working. 5. Natural can be used on casual going out or any other occasions. 1. Made from superfine nanometer materials, which are 250 times thinner than a hair strand. 2. Able to penetrate your pores while cleaning face. 3. Helps to remove blackheads & impurities as well. 1. Helps to sharpen your nose with much ease. 2. Product will not cause any difficulty in breathing & discomfort supposingly. 1. Clip on nose & adjust the position of the apparatus until you feel comfortable. 2. Use for 10-15 minutes everyday for the best effects. 3. Not suitable for children below 12. 4. Do not use product on open wounds. 5. Temporary stop usage if you experience any discomfort. 1. Designed especially for nose. 2. Helps to remove impurities such as blackheads, from pores. 1. Moist your face with water. 2. Apply your facial cleanser. 3. Use the brush to scrub gently on your nose. 4. Wash off with water will do. Use it daily for 20 mins. Use it when driving, reading, watch TV or exercise. Not Suitable for under 12 years of age of puberty stages. 1. 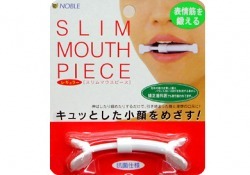 Allows you to exercise your mouth to slim down your face. 1. Use this every morning and night for the best effects. 2. Every usage should be around 2 to 3 mins. 2. Helps to whiten your teeth & get rid of yellowish teeth. 3. Easy to use & hassle-free. 4. Has a refreshing peppermint taste. 5. Inclusive of a re-fill. 1. Just rub it on your teeth to get rid of stains. 2. Please remember to cover cap after use. 1. Scrubs away the dirt on your tongue. 2. Easy to use & hassle-free. 1. Snoring in general is caused by over-relaxation of the upper airway during periods of deep sleep. 2. Snoring always happens during less deep sleep and deep sleep period. 3. A normal and healthy sleep cycle should include at least 25% at deep sleep. 1. Anti-Snoring Nose Clip Device made by 100% Silicone. 2. Suitable for both women and men of any age. 3. Decrease unnecessarily loud breathing & controls snoring when sleeping without interfering the normal sleep cycle. 4. Soft ,safe, effective & hassle-free. 1. Place the protruding round tips towards upper nostrils and put inwards. 2. Clean it daily after use with mild soapy water and let it air-dry. 3. May take 3 days to a week time to adapt using the device.